Having the UTMB lined up for the following month I decided to err on the side of caution and do the Lakeland 50 this year instead of the 100. 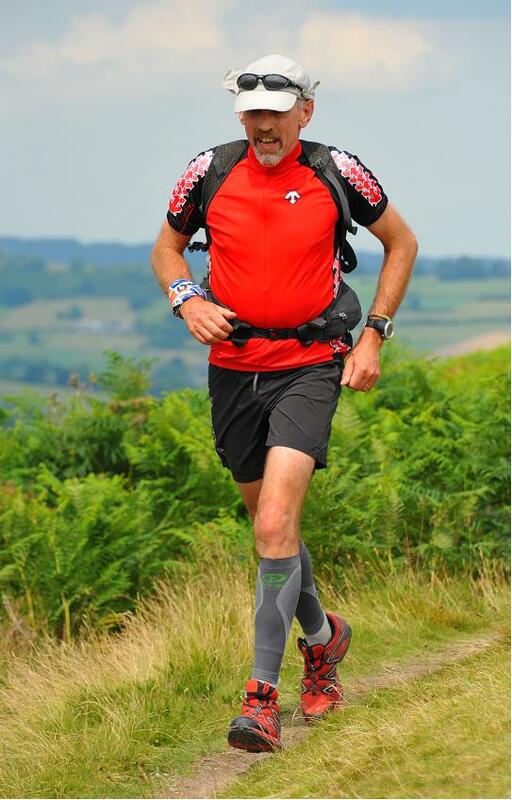 Thinking I'd cracked the secret of pain free endurance running in the Joss Naylor Lakeland Challenge three weeks previously was I in for a shock. As usual I went up on the Thursday night and stayed in a youth hostel so that I got a early start and good camping spot on Friday morning. I had booked a bed in the newly renovated Ambleside hostel but that was closed due to structural problems being found so they moved me to Coniston Coppermines hostel instead. I met Daniel Milton, a L100 competitor, there. Surprisingly there were no other competitors staying. Friday morning saw us pitch our tents not too far from the school on the road side of the field. I'd decided not to bring the big tent but did bring the porch to erect over the back of the car so that I had a covered seating area, along with my North Face Westwind 2-man tent for sleeping in. Slowly but surely the field filled with cars, campers and tents. Old friends and acquaintances turned up. Originally we had quite a few Goyt Valley Striders signed up for both the 100 and the 50 but this dwindled down to just three of us on race day, for a variety of reasons. There was Paul Hunt and Peter Davis doing the 100 and me on the 50. Other local (to Whaley Bridge) runners included Simon Moorhouse, Nick Ham (both 100) and Colin Wilshaw (50). My ultra friend Jenn Gaskell was also competing but had to get her leg taped up due to a strain in her lower leg. I had thought that watching the 100 start would be very strange having taken part in the previous 2 years but it felt like watching any other start. I kept myself busy taking photographs. This promised to be an interesting 100 race with previous winners Terry Conway and Stuart Mills present. I was also interested in what Charlie Sharpe would do. I first came across Charlie in last October's Dusk 'til Dawn 50 miler where he waltzed round in the dark in a mere 8 h 57m. Since then he'd been winning or getting podium places on a number of low profile (and some not so low) events, including beating teams as a solo runner, so it was going to be interesting to see what he'd do on this course. The story of these elite runners is interesting. Stuart employed his usual run like hell and hang on strategy. This worked as, apart from the first control at Seathwaite where he was second, he took first place and kept it to the finish in 22 h 17m. Terry went round in 3rd and 4th places but succumbed to illness and packed at Buttermere. Charlie employed a very different strategy to Stuart and started very conservatively with 27th place at Seathwaite and slowly moving up to 11th at Braithwaite. By Blencathra he was in the top ten and gradually moved from 6th to 3rd between there and Tilberthwaite. He picked off the 3rd runner on the run in to Coniston to gain an impressive 2nd place (he was a late entrant so hadn't recced as much as he might have) in 23h 02m. Next year will prove to be interesting if they all return. Back to us mere mortals, the 300 or so runners set off at the usual suicidal dash through Coniston. I then did my own dash up to the start of Walna Scar Road to catch them coming down from the Coppermines valley. I managed to catch them all, except for Peter who slipped through without me spotting him. I then watched them disappear up Walna Scar Road before heading back to base and a good night's sleep. Before getting some sleep I checked in on the progress of the 100 runners that I knew. I noticed Paul was way down at Seathwaite and immediately knew something was wrong. I texted him and received the reply that he'd gone over on his ankle at the top of Walna Scar Road and hobbled his way down to the checkpoint. Fortunately, another runner who dropped out at Seathwaite was a doctor and diagnosed Paul's ankle as having torn ligaments. It eventually swelled up to twice the normal size. Somehow, after getting a lift back to Coniston he drove home during the night. Of the remaining 100 runners, Jenn retired at Buttermere not wanting to worsen the damaged leg any further with the UTMB only a month away, Peter retired at Dalemain, Daniel retired at Kentmere and Simon retired at Ambleside. Nick made it back to Coniston in 33:37. He also had the UTMB to tackle. So, getting some sleep that Friday night, instead of tramping over Black Sail pass, didn't feel as strange as I thought it would and I managed to get a good night's sleep. The morning went quickly enough and we were soon on the fleet of buses to Dalemain. Colin and I managed to get an early bus so we had plenty of time to relax in the shade of a tree at Dalemain and cheer the 100 runners on their approach to the Dalemain checkpoint marquee. It's then time for us to perform. The new start time of 11:30 arrived and we were off. The initial 4 mile loop around the Dalemain estate was new to me. It was also very hot. It consisted of a rolling trackless route through grassy fields which brought us out at Dacre castle then back along to Dalemain House along the 100 course. You would have thought that I'd learnt my lesson back in 2011 during the Ridgeway Challenge run when I set off far too fast feeling cocky after my L100 success. My legs were wrecked for the next 75 miles. Back on the L50 I now did exactly the same feeling cocky after my relatively painless Joss Naylor Challenge. (The fact that it was only three weeks previously wouldn't have helped either.) I stormed through the first leg to Howtown covering the 10.2 hilly miles in a little over a hour and a half, passing Nick on the way down. I then paid the price for the next 40 miles. The cramps started on the way up Fusedale. Actually, to be accurate, they started the week before as I was getting calf cramps in bed most nights in the previous week so something was afoot. Once up onto the top I managed to shuffle between the Kops. Just before reaching the turning point where we dropped down to Haweswater I heard a runner coming up behind me. I could tell it was a woman from the breathing noises but these were combined with a healthy dose of spitting like a trooper. This turned out to be Rachel Ball from the ubiquitous Sunderland Strollers. She eventually finished in an excellent 2nd lady position. She passed me tootling along like a Duracell Bunny and went chasing a group of three runners in front. Problem was they'd missed the turning down to Haweswater. I initially thought they were being sticklers to the route and not chopping off the corner but they carried on heading off towards the Pennines. I called them back, much to their relief. 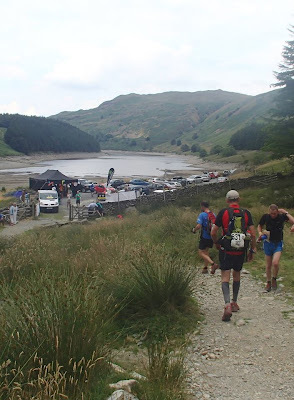 I don't remember much about the run alongside Haweswater apart form feeling sorry for the hikers trying to come in the opposite direction. One other memory was passing a young man who was wearing very minimal Inov8s who looked as if his feet were very sore (after less than 20 miles). I later found out who he was. He packed at Mardale. He later attempted the UTMB CCC in only slightly less minimal shoes and packed after 30 miles. I wonder if he's got the message yet. The Delamere Spartans did a grand job of manning the checkpoint. The portaloos also came in handy but no repeat of last year's stomach problems thankfully. The climb up Gatesgarth went OK. I chose to leave the checkpoint with empty bottles and fill up at the stream near the top to save carrying it up the hill. The cramps really kicked in on the way down. I found that I could eventually get moving on the downhills and somehow break through the cramps. It was on the uphills and slow technical sections that the cramps literally crippled me. For once I managed to leave Kentmere in a reasonable time, after sampling their lovely smoothies and pasta. Colin arrived as I left. I shuffled my cramped way up Garburn being passed all by a number of runners. Fortunately I managed to breakthrough the cramp and get a decent move on down into Troutbeck. I was reduced to a walk over to Ambleside until the down hill when I got going again. It was like the Tour de France with the crowds leading into the new checkpoint (which I found cramped and hot so didn't hang around long). On leaving the checkpoint the heavens opened. I sheltered under a tree while I put my jacket on. The cramps were attacking me all along the next section. Every muscle below my knees was in spasm. I managed a jog along the riverside to Elterwater where I suffered the ignominy of being passed up the hill to the quarry by a couple of 100 milers (who I'd just passed). I managed to run into the checkpoint with them, passing the cheering drinkers outside the Wainwrights Inn in Chapel Stile. This checkpoint keeps moving further along the route each year. At it's current rate it'll be in Consiston by 2019. I don't want to complain but I found the Heinz big soup a poor substitute for the lovely thick stews served up in 2011. The cramps were now reducing me to a very painful walk. The rocky section after Blea Tarn proved very difficult. I couldn't control my feet as the cramps were making them point downwards and in random directions. Not ideal when careful foot placement is required. I do remember be able to run the road section into Tilberthwaite. I was quickly in and out of this checkpoint as I believed that a sub-12 hour time was still just about on the cards. This was were my wheels well and truly came off. As I climbed out of Tilberthwaite I began to feel weaker and weaker. I somehow made it over the rocks and onto the flatter section where I had to stop and rest my head on my poles feeling extremely weak and sick. I came round a bit but the next couple of miles was pure misery. People came streaming past me (19 in all) as I trudged to the col above Coniston Coppermines. I felt a bit better by this point but then I tried to descend. As I began to drop down towards Coniston the pain from the cramps brought me to a stop. I couldn't move forward. I tried walking backwards but the ground wasn't suitable for that. I'm not sure how I got down but I eventually made it to the more runnable ground and managed to get going again. I ran the rest of the way to the finish arriving at 3 minutes to midnight in a time of 12 hours 24 minutes 117th out of 583 starters and 482 finishers. At least I managed to finish in the same day that I set off. Colin turned up some 20 minutes later. Overall, in the circumstances I'm pretty pleased with that result. Still inside the upper quartile. It could have been a whole lot worse if I hadn't been able to get some decent downhill runs in. I learnt my lesson though. I would not be setting off quickly in the UTMB. That's an evocative report, Mick, and your time was amazing considering you were so slowed by 'issues'.